The intake air temperature sensor, mounted on the mass air flow meter, monitors the intake air temperature. The intake air temperature sensor has a built-in thermistor with a resistance that varies according to the temperature of the intake air. 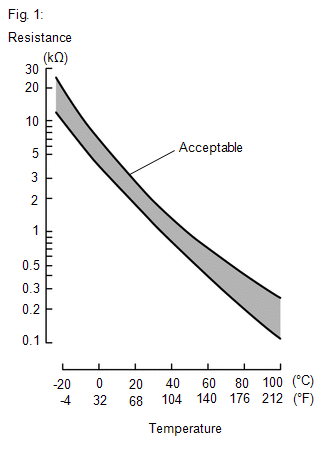 When the intake air temperature is low, the resistance of the thermistor increases. When the temperature is high, the resistance drops. These variations in resistance are transmitted to the ECM as voltage changes (see Fig. 1). Resistor R and the intake air temperature sensor are connected in series. When the resistance value of the intake air temperature sensor changes, according to changes in the intake air temperature, the voltage at terminal THA also varies. Based on this signal, the ECM increases the fuel injection volume when the engine is cold to improve driveability. Either of the following condition is met (2 trip detection logic). The intake air temperature change from the previous trip warm up to the following trip is small. The change in the intake air temperature after engine start is less than the threshold value. The ECM performs OBD II monitoring based on the values from the intake air temperature sensor. If there is no change of the sensor value within the normal range, the ECM will not be able to perform OBD II monitoring or will misdiagnose that there is a malfunction in the sensor. The ECM detects when the intake air temperature sensor value is stuck by performing monitoring after the ignition switch is turned off or the engine is started (short soak or long soak). Idle the engine for 5 minutes or more [C]. 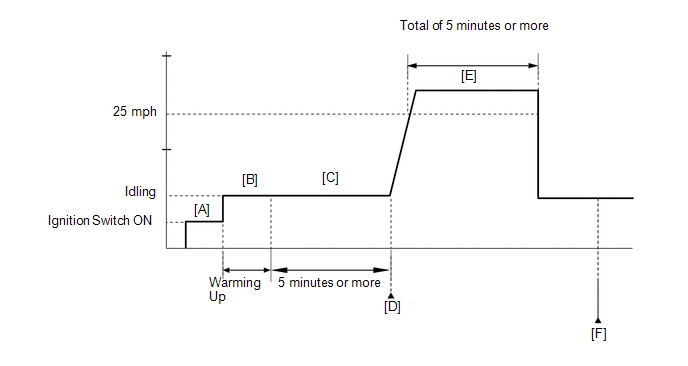 During steps [A] through [C], if the change in the intake air temperature is below 1°C (1.8°F), the intake air temperature sensor (mass air flow meter) is malfunctioning. It is not necessary to continue this procedure. If the judgment result shows INCOMPLETE or N/A, perform steps [E] and [F]. Drive the vehicle at 40 km/h (25 mph) or more for a total of 5 minutes or more [E]. Check the DTC judgment result again [F]. If the judgment result shows INCOMPLETE or N/A, perform steps [E] and [F] again. Refer to DTC P0112 (See page ). If any DTCs other than P0111 are output, troubleshoot those DTCs first.